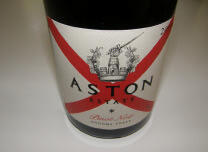 Aston Estate was launched in 2001 by three partners including winemaker Thomas Rivers Brown, Frederick and Carol Schrader of Schrader Cellars and Chuck Sweeney of Vine Cliff. Schrader Cellars specializes in Cabernet Sauvignon which is vinified by Thomas Rivers Brown and has been highly praised in the wine press. Grapes are currently sourced from the 15-acre Aston Estate Vineyard in Annapolis that is warmer than the Occidental-Freestone area. The vineyard is about five miles and two ridge lines in from the coast just outside the fog line. The Aston Estate style is different than the Rivers-Marie Pinot Noirs and is largely dictated by Frederick Schrader’s palate. The grapes are picked riper, the wines are fruit-driven and are less acid-driven, and they exhibit a blacker fruit profile. Thomas describes it as “an old Central Coast style .” The clones used are Dijon 115, 667, 777 and Swan Selection planted in Goldridge soil. Yields are small, less than 1.25 tons/acre. The vineyard is managed by Ulises Valdez. Schrader planted also planted a vineyard in Cazadero to California heritage clones. The 40-acre Sonoma Coast estate, named Boar's View, is planted to 25 acres of Pinot Noir along with Chardonnay and Syrah. The name Boar's View is derived from the property's location which overlooks Marcassin Vineyard (Marcassin is French for "wild boar."). This vineyard is the source of wines for the Boar's View label, also made by winemaker Thomas Rivers Brown. The wines are in retail distribution, particularly sources that carry Schrader wines and are sold through a mailing list that is managed in conjunction with Schrader Wines. The 2008 vintage Pinot Noirs were lost to smoke damage from that summer's wildfires.